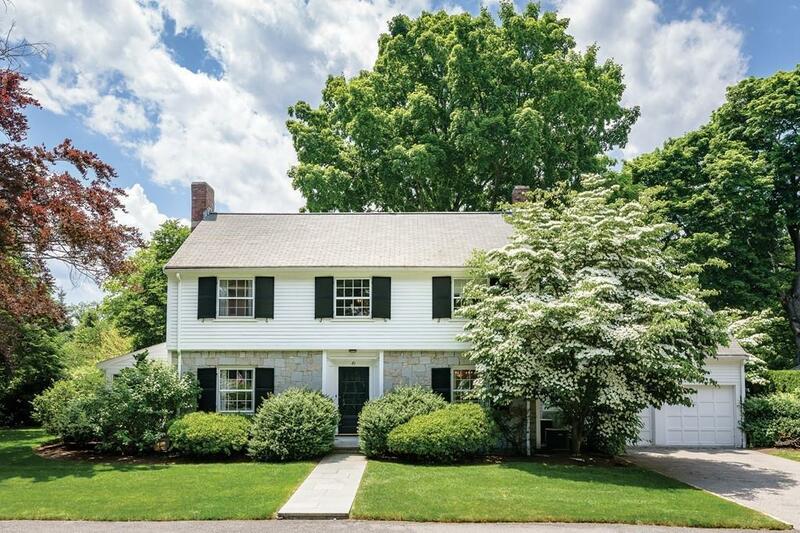 This spectacular stone-front Colonial-style residence is set along one of West Newton Hill's gas lamp-lit streets. With over 2,400 square feet of living space, there are four bedrooms, three and one-half bathrooms. The foyer, with a graceful Bullfinch staircase, leads to a stunning kitchen with Carrera marble countertops, stainless steel appliances, and a banquette with sliding glass doors opening to a patio and beautiful gardens. A small study next to the kitchen, dining room with built-ins, a large living room with a fireplace, attached sunroom, and a half bathroom complete this floor. The second level is comprised of a master bedroom with a walk-in closet and renovated bathroom; two additional bedrooms; a full bathroom; and a guest suite. The basement is partially finished with a fireplace in the family room. A washer/ dryer and a cedar closet complete this level. Listing courtesy of Karen Fallon of Hammond Residential Real Estate. Disclosures There is No A/C in Bedroom Over Garage. Exclusions Exclusions: Living Room/ Dining Room And Master Bedroom Curtains. Listing provided courtesy of Karen Fallon of Hammond Residential Real Estate.